Hi all, I feel like today is a big day for me. As promised, I'm over-the-moon excited to share a handful of recipes from Super Natural Every Day with you. It feels like it has been a long time coming! You can download the recipe sampler PDF here. The file is quite small, just 2MB. It is twenty pages in length, and includes six of my favorite recipes from the new book. It also includes a number of photo out takes that didn't make it into the final book. In short, a little teaser of the book to come. I can't remember if I've mentioned this before, the book chapters are organized: breakfast, lunch, snacks, dinner, drinks, treats. Structured in the way a typical day might unfold for me. The recipes are all written in cups / oz / grams. Which I hope will be helpful for those of you who are cooking from it who aren't from the U.S. And, as you can see in that graphic up above, the sampler includes recipes for Millet Muffins (thank you Jess, my nephew loves these), Ravioli Salad, Avocado & Mustard Seeds (a terrific way to use avocados that isn't guacamole), Black Sesame Otsu, Tinto de Verano, and a Tutti-Frutti Crumble (I put beaujolais & poppy seeds in this). For those of you who have missed the last couple of book-related posts, Super Natural Every Day is available for pre-order on Amazon for $13. There is a list of alternate retailers on this page, and on the final pages of the recipe sample PDF as well. A winter favorites list made up of a few things that have caught my attention or inspired me lately. Also, links to some pretty desktop patterns and iPhone wallpapers from Super Natural Every Day. 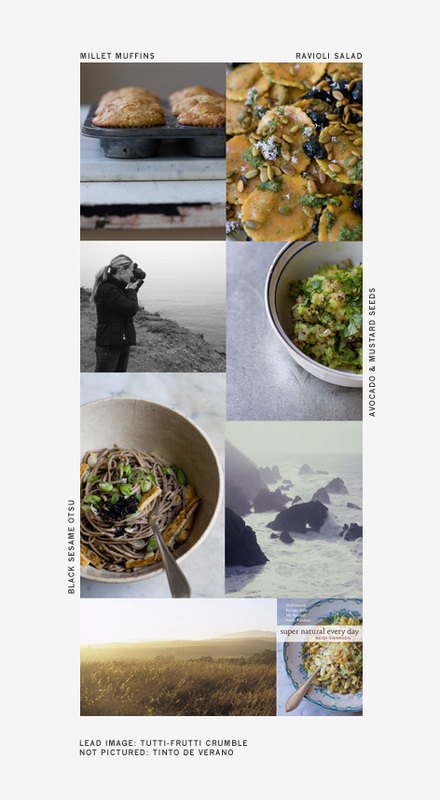 A preview of a few pages, along with some notes, from my next cookbook - Super Natural Every Day. A few notes on the creative process related to the manuscript for my next book, Super Natural Every Day.